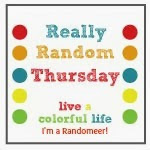 Live a Colorful Life: Happy birthday/blogiversary to my sister! Have you met my sister, Carla, from Lollyquiltz? Well, she isn't my real sister, not from a biological standpoint. However, as we have gotten to know each other a little better, we have decided that perhaps we are sisters separated at birth. SO many similarities! *We will both be married for 38 years this year. *She went to college in Kansas. I went to college in Kansas. *We both met our husbands in college. *We both have red hair. *We absolutely adore our grandchildren. *We are both quilters. Which binds us together (yes, I could not resist the pun...) for sure! *We are both hexie obsessed. (I have quite a few more than this, but they are not sewn together yet). I attribute her progress on the hexies and Kleenex-box quilt to the fact that she is older. That seems reasonable, doesn't it? She has a tremendous sense of color. And I'll admit to being a bit envious of the beautiful backdrops she uses for her quilt photography. To celebrate this auspicious one-year blogiversary, we are giving away one of my selvage pincushions, appropriately named "Four Seasons." Head on over to her blog and do some reading. While you're there, you'll notice that Carla has some awesome tutorials, so for a chance to win the pincushion, check out the tutorials on her sidebar, and then come back and tell me which one you would like to try first. The winner will be chosen on Sunday, 6 p.m. PDT. Want an extra chance to win? If you can guess (in a separate comment) which one might possibly be MY favorite, well, you'll get a second chance to win. Happy reading, everyone. And happy first blogiversary, Carla! I definitely follow Carla's blog - I'm in a VQB with Carla, she's a wonderful block maker too! I really need to make myself a mug rug - so I'll be sure to test out her self-binding tutorial when I get to that stage! I love her selvage pillow, I will have to try that pattern. Oh and I love hexies too. As to your favourite well my guess would be selvage pillow, because you love selvages. I love the liberated cross block block so that's what I'm trying first! I'm going to guess the liberated cross would be your favourite too! 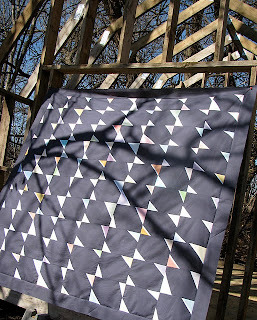 I have already made a quilt using her asterisk block. 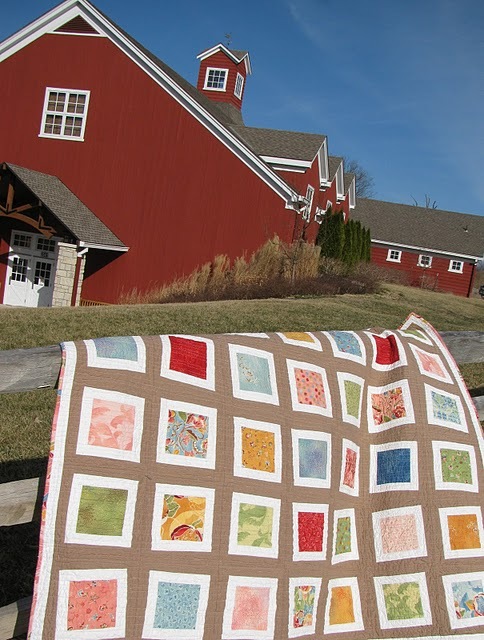 It is an easy way to make a quilt have character. Thanks Carla, for your tutorials! Both of you are so talented. Isn't it fun to get to meet others through blogging? The selvage pillow is fabulous, but I also thought the liberation border was such a great idea. My guess is the selvage pillow! I have a few selvages but haven't tried making anything with them yet. I would love the pin cushion....hint hint!! I would love to try out the selvage pillow tutorial, I have a couple good size bag of them in the closet. Well I am hopping over there now! I like the Liberated border tut. I think you like the selvage pillow. I may be your long lost triplet sister- LOL!! Carla and I have discussed how much we are alike. I believe I might be the same age (I'll not reveal that here), I will have been married 38 years in May and I met my husband in college (UCONN not Kansas)!! 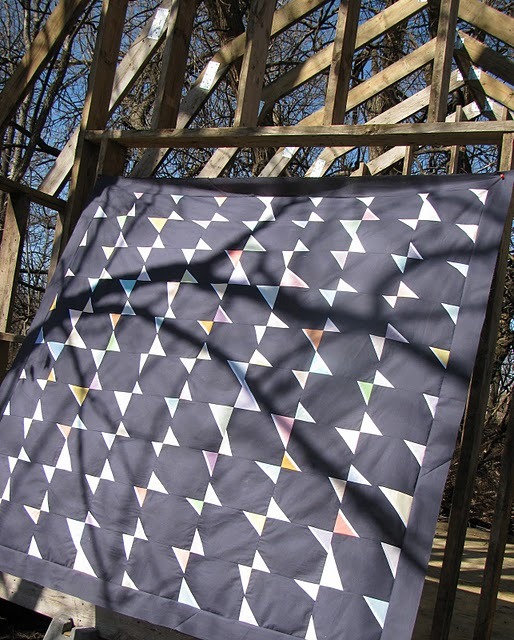 I've been a quilter since 1969 and I'm getting ready to start my hexies!! I'll come back again, your blog is wonderful. Your selvages are adorable - have not tried that yet! I love the whirligig block - I've never seen anything like it. The mug-rug binding tutorial is pretty helpful too. would love to try the selvedge pillow! Easy Peasy Binding for a Mug Rug is definitely the top of the list for me... might even go there tonight! :o) Thanks for a wonderful new blog to follow! Hi Cindy, I've had fun getting messages from some of your friends who have stopped by for a visit! I love having you for a sister/friend! Thank your for the nice feature and giveaway. 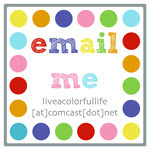 It's so nice to find a wonderful new (to me) blog thanks to Carla. I've been wanting to try an asterisk block for a while now and didn't even realize Carla had a tutorial! My guess on your favorite is the selvage pillow since I see a few selvage projects here on your blog. I want to try the mugrug binding tute. I bet you liked her asteriks tute. How fun! You know, it's funny that ya'll have so much in common because when I first started blogging and "met" both of you, I used to get the two of you confused LOL. I admire both of you and I'm so glad that you are friends! When I opened your blog today, I thought everything looks so familiar (because I always look at the picutts first) and then I thought, wait, I saw that on Carla's blog. Then I began reading and got the whole story. I know Carla from the Kansas City Modern Quilt Guild. I guess it's not that unusual to know another modern quilter but I had to send a note. I love her selvage pillow tutorial. I have been saving my selvages. I don't quite have enough yet...but it's growing! Although I love all your selvage work and you certainly don't need a tutorial (you could write several), I would guess that the selvage pillow is your favorite! I love the funky liberated border. And I love that now I am familiar with ALL her tutorials! This whole week has been so much fun, in so many ways! Thanks to all you wonderful "bloggy quilters"!!!! Or is that "quilty bloggers"??? I would like to try the brick block. I have some perfect fabrics for it. 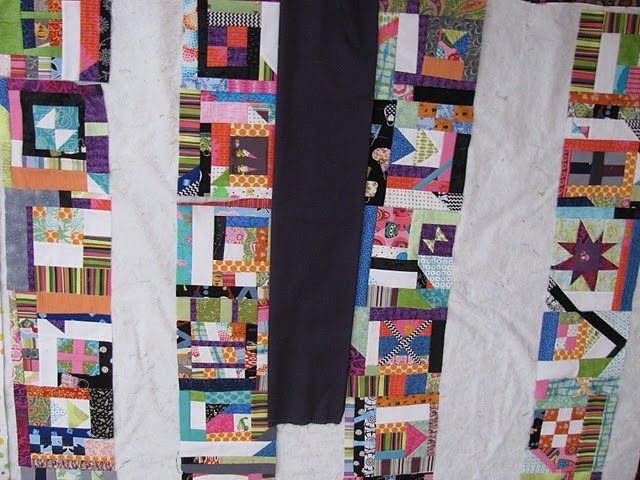 I wouldllove to try her "funky liberated border" as I like to add borders to quilts but they often look too plain! I love the Bright Hopes Whirligig Tutorial! 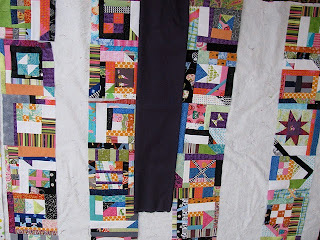 I follow Lollyquiltz blog...and I love her Whirligig tutorial! Thanks for a chance to win your adorable pincushion! I guess I'm going to make a guess that you might like her Selvage pillow?!?! It looks like your style. =) Thanks again! You will have to send the Kleenex company a picture of your quilts when you finish them. 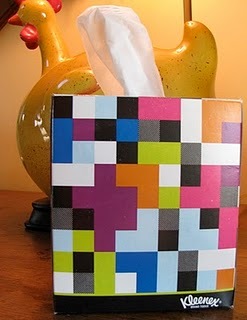 Can't you see that in an ad - "comfort when you are sick is a handmade quilt and Kleenex tissues"? Every time it would come on tv, I could say, I know who made that quilt! Wow, they are all great tuts! I really love the selvage pillow because I don't have to wait to have enough selvages to make a whole quilt. I'll say you like this one too. thanks. It has to be the binding on the mug rug...wish I had seen this last week I just made one for a friend....the binding takes forever. Thanks for a chance to win your lovely pin cushion. I am guessing (looking at your pincushions) your favourite must be the selvage pillow. I like the bright hopes whiligig block. I must try that!! Of course you like the selvage pillow!! Love Carla's blog. I like her Improvisional Mile Bricks. What a fun way to spend a blogiversary with your cyber sister.